During the recent onslaught of the ‘Beast from the East’, the bar managers and chefs of the Butchers Arms couldn’t reach the pub. Sharon and Mark, together with a young volunteer who trekked through heavy snow from across the valley, and Emily, their twelve year old daughter, who couldn’t get to school on the Friday, managed it alone. All the table reservations were cancelled but the village regulars, most of whom were snowbound and couldn’t get to work either, used the opportunity to relax with neighbours in the comfort of the warm pub. One working couple, who had not stocked up, came every day for sustenance and conviviality. On the Friday thirty walkers descended from the next village, where their own pub was temporarily closed, for food and comfort liquids. It was a very busy time for Mark, Sharon and Emily who cooked, served drinks, dealt with the general catering and engaged everyone with a cheerful welcome. As Mark noted ‘It was very enjoyable. There was less pressure to serve customers quickly with drinks and food because nobody was in a hurry. It was more of a bar/café atmosphere and it was a pleasure for the three of us, as a family, to be part of this defiance of the “Beast from the East”’. By Sunday night they were exhausted but looked back on a unique experience with considerable pleasure, knowing that they were a haven for the village in times of adversity. 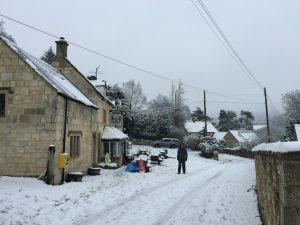 At the Carpenters Arms in Miserden they were also snowed in, again all table reservations were cancelled, but Kevin and Debbie, the resourceful managers, advertised a ‘snowball fight’ in the surrounds of the pub and a disco inside. Many families and other villagers came making it an enjoyable time, with the pub taking £800. ‘It was just like Christmas week’ said Kevin, although there were other downsides such as pipes freezing. At the Woolpack in Slad, they were inundated over all four days of snow with people who couldn’t get to work but made it to the Woolpack. ‘It was a wonderful atmosphere’ said the manager Harry who had to drag his hard working primary school teacher partner out of bed to help in the bar. 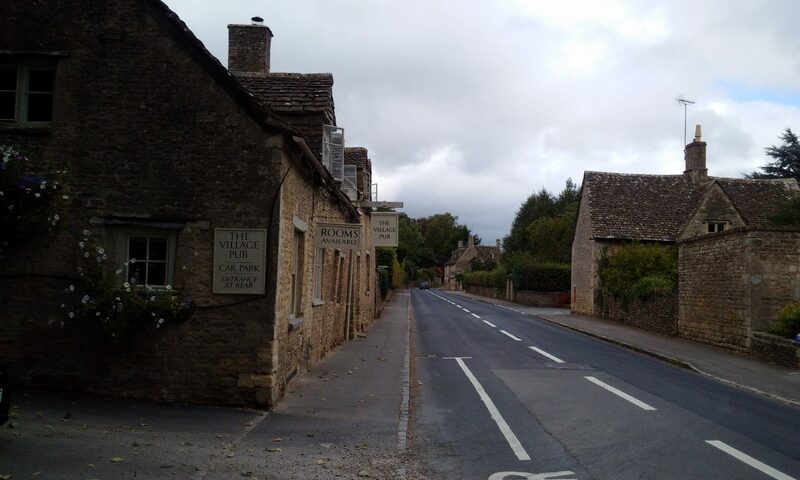 Only half of rural settlements in the UK have a pub and its value to the village should not be underestimated. It is clear from research, and evidence from estate agents, that that the presence of a pub in a village adds tens of thousands to the value of those village properties. The presence of services, communal spaces and wider social activities is often tied to the presence of a pub in the area, particularly in rural localities. Research also shows that pubs act as incubators and facilitators of community cohesion; they can have a major impact on leisure activities. A pub today is home to: the kennel club, the knitting circle, the literary circle, music clubs, sports clubs, religious events, friendly societies. They are also: a children’s playground, a job centre, an epicurean centre, an arts centre, an historical archive, a library, an entertainment centre, a social club, a games centre and a haven. Pubs also play a role in economic development through social aggregation and they generate employment for young people, e.g. : supporting B+B, outlets for local micro-breweries and as casual employment of local youth. They help generate social capital, which is defined as human relationships and skills and social values embedded within individuals operating in informal networks. The village pub acts as that third place, after home and work, where human interaction and social welfare is generated. Once a village pub is lost, while the location might remain, it is no longer a ‘place’. Rural areas have been hit particularly hard with 14 pubs shutting each week in 2012 and beer sales lower than at any point since the depression of the 1930s; CAMRA report that 985 pubs across the whole country closed in 2017. There are many reasons for these closures e.g. alcoholic consumption is steadily declining; tastes and lifestyles have changed with many people now buying their wine and beer more cheaply from supermarkets. Anecdotal figures from publicans suggest that only 15-20% of villagers support their pub regularly and so the village pub has to become a ‘destination pub’ attracting people who value being able to eat in a rural location with features that make their visit a memorable experience. Visitors can sit in these environments, some of which date from the 17th Century, and enjoy the history of the pub and village through the artefacts and pictures, crammed together on every wall, evoking, for them, an idyllic rural past. So, it is important that villagers support their village pub for to neglect it could mean its disappearance and then the village would lose much more than just the pub.